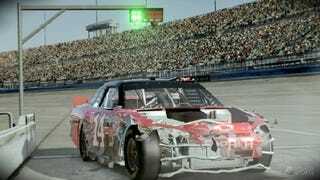 Earlier this week Eutechnyx, the studio behind NASCAR's revival on console gaming, delayed NASCAR 2011 to March 29. Then word passed that the racing series will refining its championship points structure for the next season. Were the two related? No. At least according to Gregg Baker, the Eutechnyx community leader. Speaking to Operation Sports, Baker said the game was "in a shippable state," but delayed from mid-February - and an important pre-Daytona release - to late March to give it more polish. "We wanted the game to look as good as possible and felt the short delay would make sure we hit our level of standards," Baker said. That said, "there were a couple more features we wanted to include — these will be confirmed closer to release date," he said. While that sounds like it could account for a points system adjustment, I emailed a representative for the game and was told that NASCAR's proposed changes were not a factor in the delay. NASCAR today made it clear that some change to the points system - allegedly drawn up on a cocktail napkin in 1975 - will be coming. We'll know exactly what that means next week, but the racing promotion seems intent on developing one "that's just easier to understand and simpler," according to NASCAR president Mike Helton.